How much it'll cost to develop an on demand ticket booking app like Bookmyshow? Bollywood and movies are at the core of the entertainment industry in India. In fact, putting Bollywood under the banner of the ‘entertainment industry’ would actually imbalance the very definition of an industry. Bollywood is no less than a phenomenon. With every Friday, a new film hitting the theatres, there remains only one question – how do we get to see it all where the seats are available along with the other details like show timings and prices for booking? There were times when ques of people standing for hours and hours to get their movie tickets was common on the weekends. Or, they would resort to other frugal means of getting it. Now, the times have changed with a revolutionary on demand ticket booking app since past couple of years. 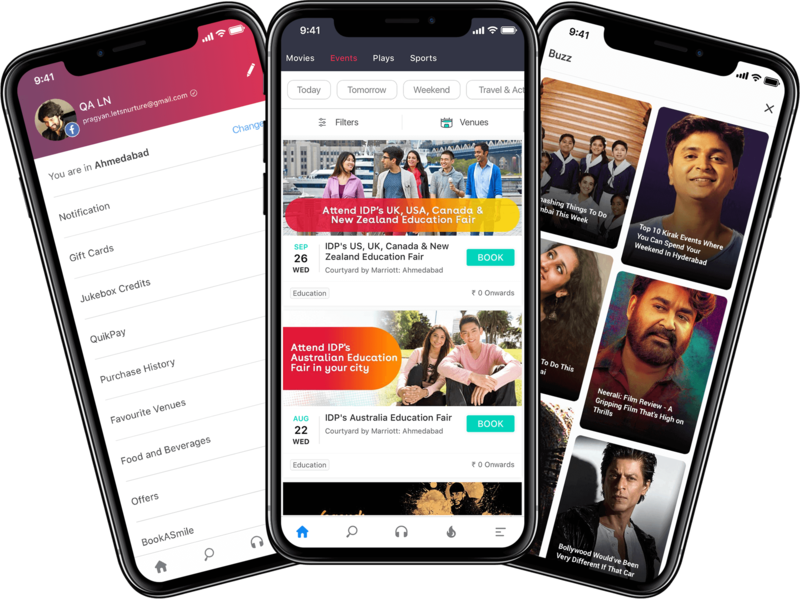 Bookmyshow, the most prominent on demand ticking app platform, has practically transformed the entire ticket booking experience. Be it movies, events, art shows, theatre or performing arts, Bookmyshow has come to the centre of this entire entertainment industry, almost channelizing great growth for the established cinema houses like PVR Cinemas. Be it a posh multiplex in Mumbai or a small secluded single screen theatre somewhere in south, Bookmyshow has its presence all over the place. The biggest strength Bookmyshow has been able to build upon, is its exclusive partnerships with PVR Cinemas and other screening houses. This has enabled Bookmyshow to gather a lot of inventory available for online booking. Commissions on ticket booking. You can charge a commission on the ticket booking from the consumers. This is a different model than the international practice because here the cinema theatres have a greater power to negotiate. Advertising. Despite getting heavy traffic on on demand ticket booking platform, mind well, not all of this traffic will result into booked tickets. Hence you will find the need to place in an advertising model to generate revenues. Event Management Revenues. Many times, ticket booking marketplace also provides event management services to events of certain scale by partnering with them on a fixed or per ticket sale basis. Exclusive Merchandise Distribution. Some players also partner with brands to help them sell exclusive merchandise on the marketplace. For instance, if it is a music fest you can help the event manager sell exclusive t-shirts, masks, wigs and everything else a fan would like to carry. The revenue comes in the form of commission per sale. Major costs include: The costs in this business are pretty linear. Primarily the costs are incurred in having the right technology in place, followed by user acquisition costs and then adding the costs of getting exclusive deals from bigger sports and entertainment brands. Looking to develop a ticket booking marketplace like Bookmyshow? There are currently only to players with pan India presence in this market – one being Bookmyshow and the other one being Paytm. 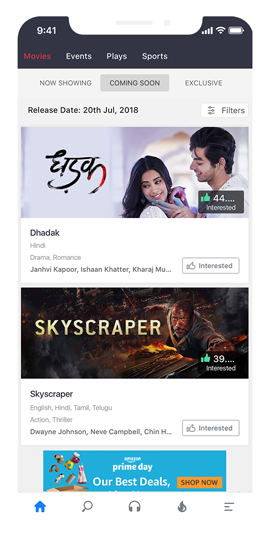 While Paytm has gone for a horizontal integration, Bookmyshow still has a strong foothold. Despite of their presence, there are many events in local spaces which are not covered by any of the marketplaces. These events are mostly listed on Facebook Pages and WhatsApp groups. Hence, there is still a huge scope of developing an on demand ticket booking marketplace which caters to the local needs of experiential entertainment in India. There are even more entertainment avenues like art exhibitions, English plays, music performances, circus and other events, which can be placed on your marketplace with the right partnerships. All you would now need, is reliable technology partners in the form of best on demand booking marketplace app development company – that is exactly where we come into picture. We have significant experience in developing custom apps for entrepreneurs as well as businesses. With our team of expert app developers, UI/UX designers, business analysts and product managers, we can help you thoroughly develop your app idea. The cost for developing a ticket booking marketplace like Bookmyshow will come in the range of $32000-35000. Let’s have a look at the detail cost break up for the app. Having a live chat can immensely help you connect to your audiences. You can have an integrated solution to your ticket booking app that connects them directly with the sales representatives or you can have an algorithm take care of the common queries or have a hybrid model. The data is generated by the user accounts and the general browsing through the app. These dashboards help you get better understanding of the data using custom metrics and analytics reports. We have extensive experience in developing blockchain ecosystems for secure payments and transactions. Having blockchain technology integrated with your on demand ticket booking app platform will cater to secure and transparent transactions. 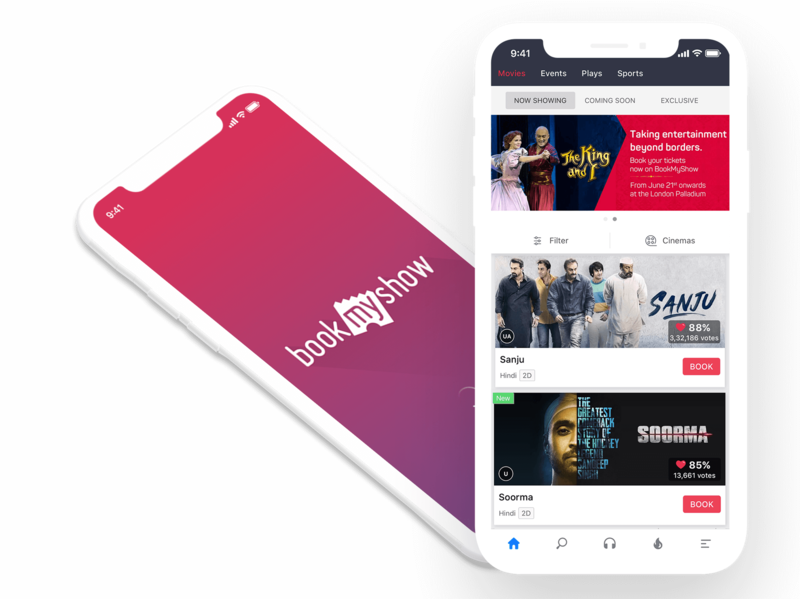 Why us for developing an on demand ticket booking app like Bookmyshow? From a distance, the ticket booking app market may already seem crowded with Bookmyshow, Paytm and a lot of scope for other players to go for a horizontal integration. That said, the event organizing, management and selling industry in India is still quite unorganized. Yet, the demand for local content and events has been steadily growing. What was earlier a trend only visible in smaller towns, has now started strongly affecting the tastes of metro cities - people are looking for more experiential entertainment. People have understood that experiences are worth their investments, a good art exhibition will beat an average big budget Bollywood movie any day. Hence, all you need to do is – bang in the middle, right upon the opportunity with our technology by your side. How much time will it take to develop and deploy a system like this? We estimate a high level timeline of 13 to 15 weeks considering website plus two native apps on Android and iOS. What are the various avenues for ROI on a project like this? Which payment system is best suited for my marketplace? For a global marketplace, Stripe or Paypal work best and for local regional marketplace, we recommend Payment Gateway most prominent or widely accepted in that region. Should I have a refund policy in my marketplace app? As each venue will have limited number of seats/ tickets and last minute cancellations affect business bottom line. This is not advisable to include if specifically needed, we can devise and implement bespoke refund policy for your use-case. Have an !dea to develop an on demand ticket booking app platform like Bookmyshow?